Are you looking for an inexpensive, quick, and minimalist case for that professional oriented smartphone in the Samsung Galaxy Note 4? Sure, you could go with those rugged or specialty cases, but if you prefer a barebones and simple one, you don’t need to look any further than the Spigen Ultra Fit case. As its name implies, the Spigen Thin Fit case is a straightforward hard case that’s constructed out of a single piece of polycarbonate. Our particular unit, one that features a black soft touch matte finish, maintains a nice clean look that’s resilient against fingerprints, smudges, and other nasty baddies that might otherwise dirty it up. At the same time, its soft touch finish provides a fair amount of grip as we hold the phone in our hand. 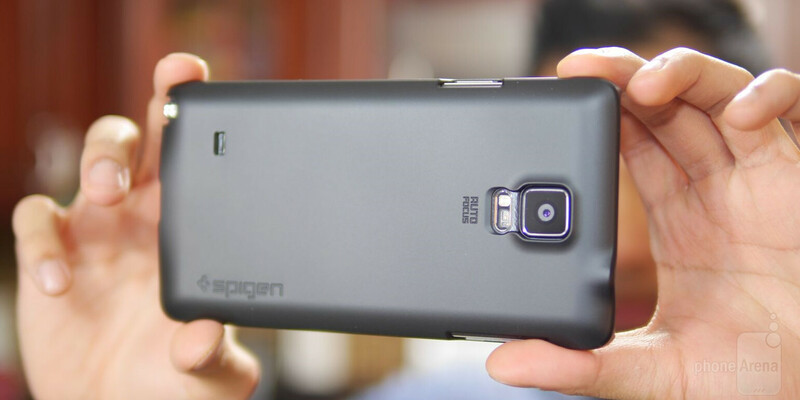 Naturally, the Spigen Thin Fit case helps to maintain the Note 4’s svelte body – so there’s no bulk added on to the phone when it’s on. The downside with that, though, is the lack of protection against drops. Seriously, it’s something that you don’t want to drop onto the concrete ground, just because it’ll incur some serious damage in the process. However, it’s decent enough to protect the phone from minor things – like from being scratched when it’s in your pocket. In terms of pricing, you can pick up the Spigen Thin Fit Case for the dirt cheap price of $11 through Amazon. Needless to say, that’s a price point that won’t take a bite out of your wallet, but bear in mind that it’s nothing more than a simple case.